Baking soda is excellent for basic household cleaning. Salt is a natural disinfectant with abrasive properties. Sunlight works as a natural bleaching agent. Vinegar is an exceptional cleaner! The sight of your kitchen sink filled with greased, dirty utensils can make you feel miserable. Is removing germs, stubborn stains and grease off kitchen utensils become a frustrating task for you? Baking soda is excellent for basic household cleaning. It can also be used to clean up stubborn mess on utensils. Baking soda works great on grease that has dried up. 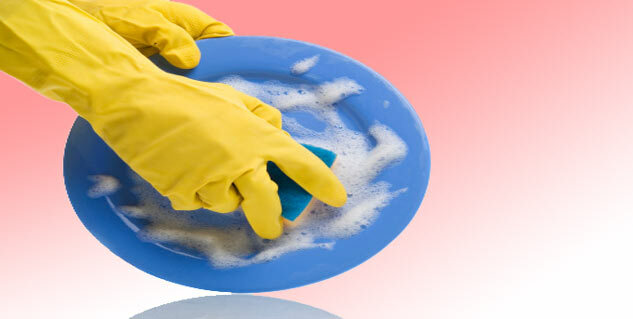 For best results, sprinkle some baking soda onto the cleaning sponge before using it on the utensils. Vinegar may not smell nice, but it is an exceptional cleaner! It helps you get rid of greasy stain from your kitchen utensils. Combine a few drops of vinegar in water and soak the utensils in the solution for a few minutes. Take utensils out and wipe the dirt/grease with a cotton cloth or scrubber. Lemon is acknowledged as natural bleach. It also has the ability to clean stained and greased kitchen utensils. When combined with baking soda, lemon not only washes away grease but also makes the utensil shine. Salt is a natural disinfectant with abrasive properties. These properties make salt ideal for cleaning stained kitchen utensils. It can be used in combination with baking soda to remove dirty stains from chinaware and steel utensils. Sunlight works as a natural bleaching agent. All you have to do is keep the dishes in direct sunlight for four to five hours to remove stains and odours. When you rinse the dishes immediately after use, you prevent gunky food stains from setting in.